a widely used and efficient growing technique that The Captain, as usual, so simply demonstrated. We will be taking a break from my beloved Shiitakes to move on to the equally as fung and highly nutritious, Oyster mushrooms. Another saprophytic mushroom, Oysters enjoy taking advantage of another organisms demise by spreading their mycelium throughout a nice piece of decomposing wood. Unlike Shiitakes, the wee-like Oysters can quickly spread throughout the wood producing a large quantity of mushrooms, fruiting nearly 3 times as much as the Shiitake logs. A few weeks ago at the farm, a big Poplar tree fell over blocking the road. Instead of dumping this seemingly lifeless tree, it was saved and used as the perfect substrate for Totem oyster mushroom production. bigger and better ideas that may make things just a little easier. 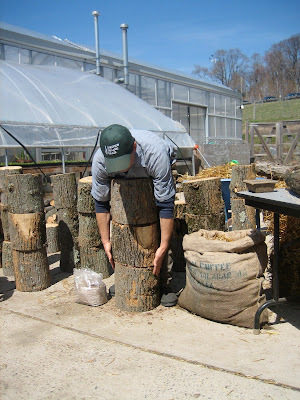 After cutting and unloading some fallen Poplar logs at the site of the annual mushroom inoculation class at Stone Barns, The Captain explained that these wood stumps were the ideal substrate for home Oyster mushroom cultivation. A few quick and easy steps and some good old fashioned patience are all it takes to get this simple backyard mushroom farm up and running. Similar to the Oak logs, we wanted to make sure we used recently fallen Poplar wood, not too fresh and not too old either, about one month is ideal. In this amount of time, the wood's natural defenses (tannin) will be significantly depleted, but still strong enough to provide an ideal home for decay loving organisms such as mushrooms. Each totem is 3 stumps high (each stump is about a foot) since that is most manageable to move and still sturdy enough to avoid falling over during the 6 month growing period. It's important to keep equal width pieces together, similar to the wooden dowel technique in that you want to minimize any space vulnerable to infection by something other than the mushroom you are trying to grow. 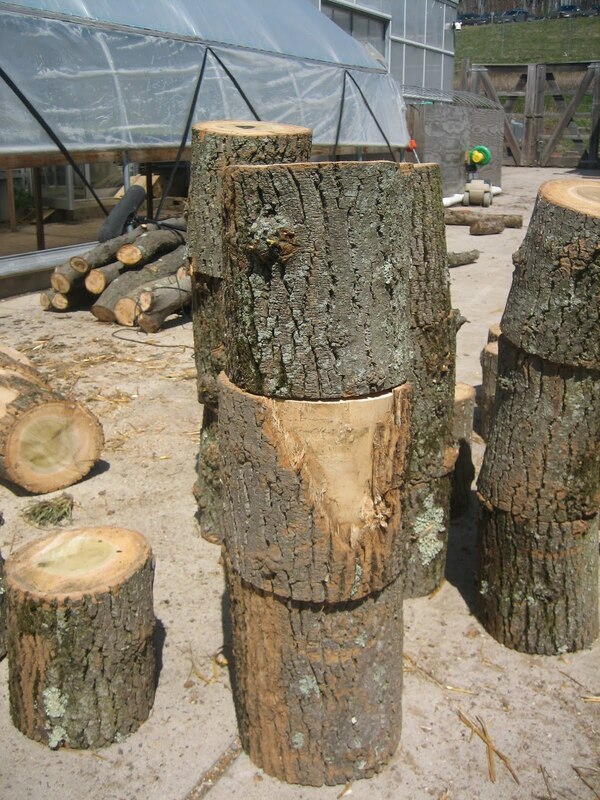 Just like getting a cut on your body, these cut stumps of wood are wounded and therefore susceptible to attack and infection. The goal here is to ensure that the only "infection" is that of the Oyster Mushroom mycelium. Once the totem is measured out, you will be creating a club sandwich of mushroom spores (do not use bacon, mayo, lettuce or tomato regardless of how tempting this may be). 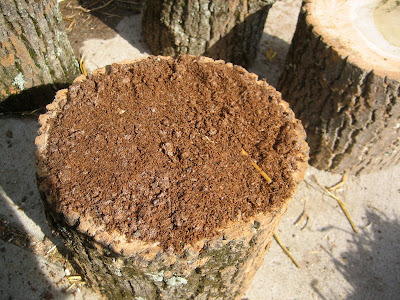 Using the sawdust mycelium, which can cover more surface area, than the wooden dowels, The Captain placed a 1/2 inch thick layer on the top of the first and second stumps. You want cover the entire surface area, to avoid any competition. There are tons of little mushroom spores all throughout this brown sawdust. Once the wood is stacked and balanced evenly, hug your stack just for good karma and then hammer in some thick metal staples to keep the totem in tact, especially since they will be moved to a dark, moist area where they can sit for the next few years. Oysters, such as these Blue Dolphins, can produce from the same wood stacks for 5-6 years under ideal conditions. These totems will produce roughly 6-8 lbs of Oysters every 6 months if watered regularly. As you can see below, these beautiful Oysters have a pearly white under section called the gills. These gills are where the mushroom spores are found. These spores act as the seed, spreading the mushroom mycelium from decomposing wood log to decomposing wood log, looking for a home to reproduce, just like a plant. I recently had an interesting conversation about signs and omens in life. A friend had spent weeks working on a project on her computer, putting endless hours of sweat and thought into something she was sure she wanted. It was close to the completion of her work that her trusty old laptop broke down and she lost everything. Here she was at a crossroads, does she simply forget all the hard work put into her project and simply start again, or does she take this as a sign that it was never meant to be? With every fallen tree, with every road blocked a new challenge as well as a new opportunity arises.